Ah, what better way to spend a summer’s day than to take a trip somewhere old and exciting! Dad and I had been talking about visiting Jerome, Arizona for a couple of months, and finally decided to head up there one afternoon in June. We chose not to stay overnight because it’s only about 100 miles from home; the perfect distance for a day trip from the Valley. In keeping with the historic nature of the town, there aren’t any chain hotels, fast food restaurants, or even a gas station within city limits. Those services are all available in nearby Cottonwood. In spite of what Jerome lacks in modern conveniences, it more than makes up for it with an abundance of rich and colorful Arizona history. My dad and I started our adventure by driving up from Phoenix. Our excitement climbed almost as fast as the road into town, which winds up Mingus Mountain at a steep grade. The two-lane blacktop snaked its way into town, passing by the colorful homes built on steep hillsides. 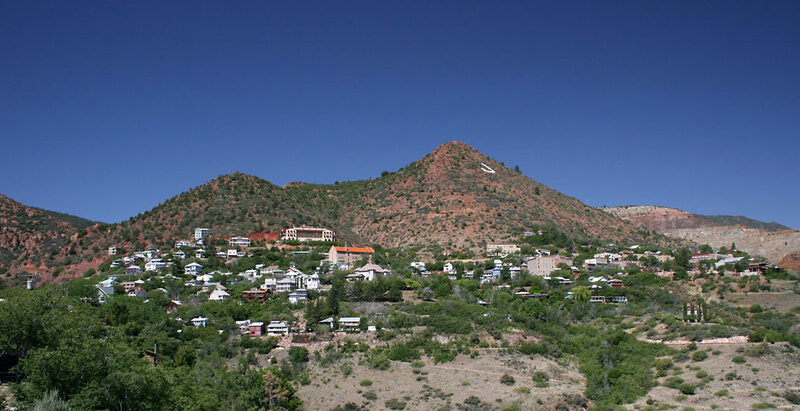 The historic dwellings clinging precariously to the side of a mountain reminded me of other mining towns I’ve visited like Bisbee, Arizona and Skagway, Alaska. The Douglas Mansion (built 1916) is the centerpiece of Jerome State Historic Park. Our first stop was the Jerome State Historic Park, which is a giant historic mansion that has been turned into a museum. James “Jimmy” Douglas Jr. had the house built for his family, though it was mostly used for entertaining guests and was never permanently inhabited. Caretakers looked after the house for most of his life. 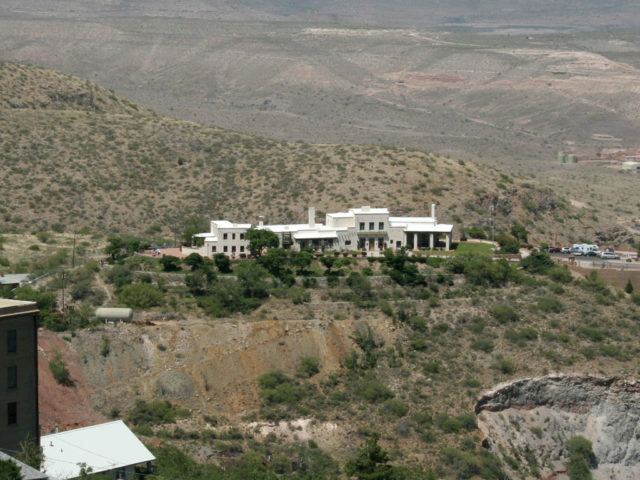 At approximately 8,700 square feet, the Douglas Mansion is easily the largest Adobe structure in Arizona. Inside, I found the house to be both cool and extremely spacious. The museum gives you an inside look at the extremely comfortable lifestyle the Douglas family enjoyed, right down to the original paint on the walls and rooms full of historic photos and memorabilia. Some of the highlights of the museum included a 3D model of the Little Daisy Mine and its underground workings, a two-car carriage house with an antique buggy, and a fantastic view of the town. I have to say that even though it’s not as luxurious as the 40-room Riordan Mansion in Flagstaff, the Douglas Mansion stands proudly as one of Arizona’s premier historical properties. Leaving the park, we crawled into town along AZ 89, which winds its way through the narrow streets up Mingus Mountain. 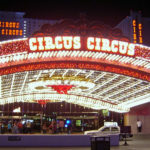 We passed by art galleries, a modern-looking firehouse, and parked in a crowded row of cars along the main street. With a rumble in my stomach, we set out in search of the Jerome Palace, home of the Haunted Hamburger. Getting there required climbing a flight of stairs that never seemed to end, but we made it to the top with minimal huffing and puffing. Blame it on the elevation, as I always say. 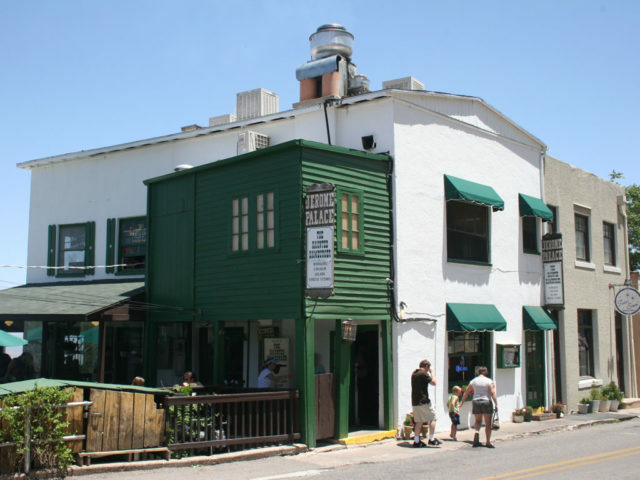 The Haunted Hamburger in Jerome serves up an excellent lunch. The restaurant was a charming family-owned business, and it was bustling with activity around noon when we arrived. Their signature Haunted Hamburger came with mushrooms, so I opted for the classic bacon cheeseburger and fries instead. As we waited for the food, I couldn’t help but notice the flurry of activity by the front door. As I went to investigate, I found a glass dessert case that was drawing people in off the street. Inside there was a chocolate cake so large that I wondered if my eyes were playing tricks on me. This cake was so tall and rich it looked as though it might have its own gravitational field, considering the crowd around it. Two dollars a slice was a bargain for such a delicious confection, but the burger was very filling and I had no room left for sweets. The Hotel Connor and the Liberty Theater. To burn off our lunch, dad and I decided to walk around and explore the downtown area. We passed by the the Hotel Connor, a large brick structure on the corner that doubled as a gathering spot for the motorcycle crowd. Next door to that was a single-screen movie theater which was being restored as a museum, and we decided to check it out. The Grand Staircase was closed for refinishing, but we took the back stairs and got to sit down inside the historic theater. We watched part of a movie about Jerome that showed men struggling to cross a snow-covered road in the 1920s. I couldn’t help but notice that the movie was shown on a digital projector hanging from the ceiling. Donations were encouraged but not required, and dad generously put a few bucks in the box. 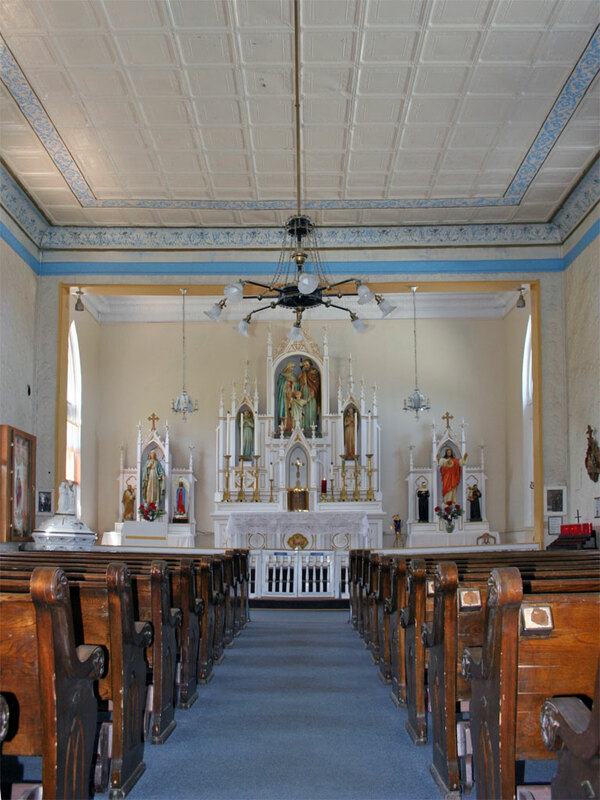 Holy Family Catholic Church (built 1894) is the oldest church in Jerome. We browsed through a few gift shops before trekking back to the car and continuing on. Farther up the mountain, dad spotted an old Catholic Church and we pulled over to explore. We found the inside to be very ornate in the typical Catholic fashion, and a sign informing visitors that regular services are held there only once a month. For weekly service, a trip down into Cottonwood is your best bet. With about 500 permanent residents, Jerome cannot help but depend on Cottonwood for lots of things. The hotel towered over me with its impressive stature. Its creamy exterior and red tiled roof mixed well together in a cocktail of visual appeal. The wrought-iron railings and antique light fixtures showed great attention to detail, the kind of detail you rarely see in modern construction. In addition to an original working elevator lift, the hotel lobby had a small gift shop in the corner. At the east end of the hotel was a restaurant called The Asylum, which set off my internal Too-Rich-For-You meter. How could I tell, you ask? Generally, any place that has duck as an entree and a wine list longer than the dinner menu itself is likely to have very high prices. The Asylum was no exception. We made our way to the car and started heading back towards downtown. 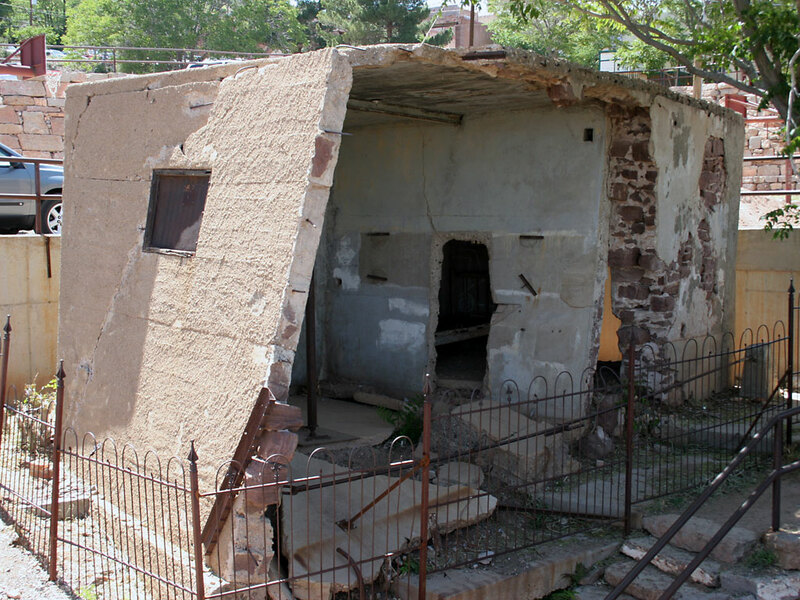 Underground blasting in the 1930s caused Jerome’s jail to slide off its foundation, more than 200 feet from its original location. Dad and I located the famous Sliding Jail, which today is little more than a cement box in very bad shape. 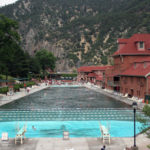 Thanks to mining operations below ground and dynamite blasts above ground, the ground in Jerome was constantly shaking and shifting for many years. In fact, the jail slid down the mountain during a landslide and now rests over 200 feet away from its original location. The Sliding Jail was not as popular as I expected; we were the only ones there. While the jail is no longer in danger of falling off the mountain, I have to wonder how many other buildings in town have been shifted around. Our last stop before heading home was an unusual one. Dad wanted to look at the historic cemetery, which we located with no trouble thanks to the directions from the desk clerk at the Grand Hotel. At the end of a dirt road we found the small cemetery, which was very spread out. Wrought iron fences enclosed many of the graves, which were unmarked. 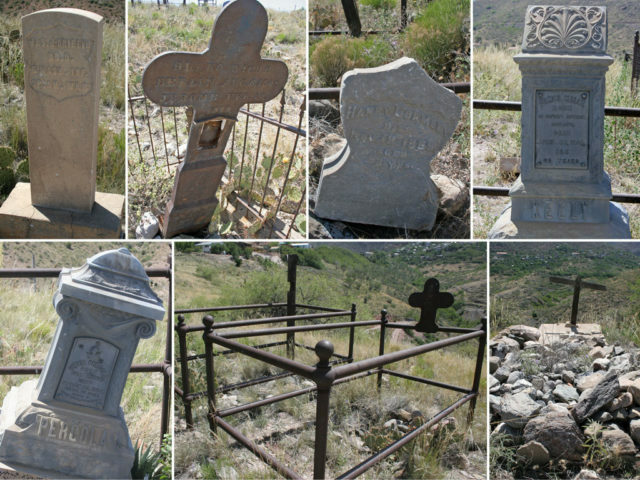 Grave markers and monuments in the Jerome Cemetery. Not all of the graves had headstones, but the ones that did were long-forgotten tributes to German and Irish laborers. The exhibits at the Douglas Mansion mentioned that a majority of the blast furnace workers were immigrants from Europe, and that working in the furnaces and mills was one of the most dangerous jobs in town. One of the oldest markers was for a fellow who fought in the Spanish American War, which both started and ended in 1898. It was very quiet in the graveyard; hanging out among the dead. You couldn’t hear the sounds of cars whizzing by or crowds of ghost-hunting tourists. All you could hear was the sound of the wind whistling through the knee-high grass. From the cemetery, there was a nice view of the town and the mine. At the time of this writing, another of Arizona’s famous wild west towns, Tombstone, is in danger of losing its historical status. In 2004, the National Park Service announced that Tombstone’s extreme focus on tourism and rampant commercialism was a threat to its heritage. 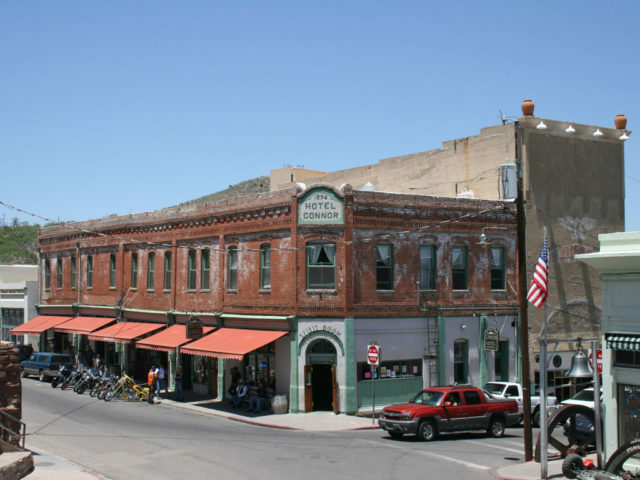 Let’s hope that the tourists never find out about Jerome, the carefully preserved and totally authentic mining town that really is a trip back in time. 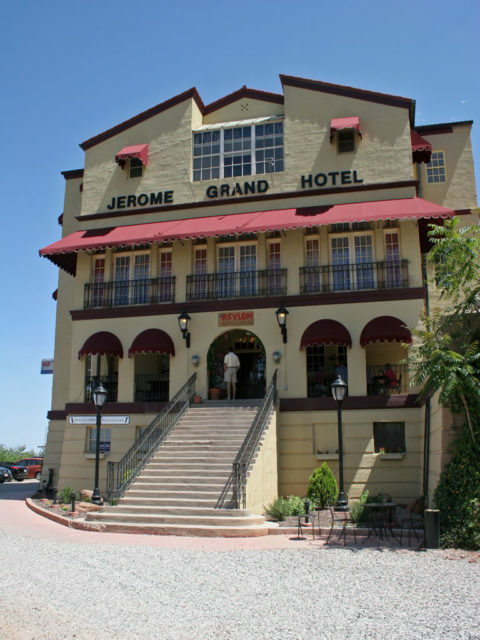 There’s something about Jerome that invites you to explore its side streets and discover its secrets. I can’t think of a single thing I didn’t enjoy about my visit. The bottom line is that Jerome is the real deal.